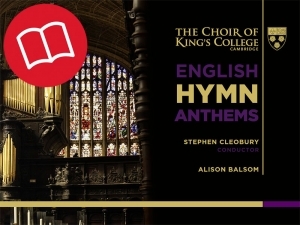 The Choir of King’s College, Cambridge presents an album of anthems based on hymn tunes from the Anglican choral tradition. Highlights include Parry’s epic Hear my words, ye people, Ireland’s Vexilla Regis, organ preludes on traditional hymns by Parry and Edwards, and Lord, Thou has been our refuge by Vaughan Williams, featuring the trumpeter Alison Balsom. English Hymn Anthems is available on surround-sound CD (SACD) and studio master & mp3 download. In this recording the King’s College Choir offers a varied selection of hymn anthems from the period of their greatest popularity, the 1890s to the 1930s. Most of them owe their materials to Hymns Ancient and Modern (HA&M), the dominant hymnal of the time. The variety of approaches to the form is reflected in their differing generic titles – anthem, motet, hymn, song. Some of the hymn texts are biblical paraphrases; some are poems not originally conceived as hymns. A hymn-anthem may incorporate existing hymn tunes, dating from the 6th to the 19th century, or launch a new tune, which may later be adopted for congregational use, as Parry’s was. Some use scriptural prose as well as a hymn. The musical treatment also varies widely: there may be a recognisably strophic form, like a theme and variations; or the tune may be a source of motives for development or fugal treatment. The two organ preludes are also based on familiar hymn tunes. The magnificent organ at King’s is well suited to the music of the period, used to great advantage by Stephen Cleobury. The choir offers a vast range of mood and expression, from tender to awe-inspiring, while the famous acoustics of the chapel add an aura of splendour throughout to this marvellous album of hymn anthems. Recorded at 96kHz 24-bit PCM 5.1 surround-sound in the Chapel of King’s College, Cambridge, by kind permission of the Provost and Fellows, 9-11 July 2013.